1) Test the soil for pH, nutrients, holding capacity and organic matter. Once you know your soil’s weaknesses, you can begin the improvement process. MT – your smartphone for grid soil sampling. 2) Address soil pH. Most crops, along with beneficial soil life (earthworms, bacteria, fungi, etc.) thrive when the soil pH is around 6.5 to 7. Fix that, and your soil will come to life. MT – variable rate lime or elemental sulfur applications to adjust pH where necessary. 3) Fertilize correctly. A farmer’s biggest expense is now fertilizer. MT – Ag PhD Soil Test app which tells you which micro, secondary and primary nutrients you actually need to improve your land. 4) Reduce tillage. This helps build soil organic matter. MT – better planters that can properly place seeds even in high residue situations. 1) Reduce erosion. This could fall under the “improve the soil” category, but I place it here because no one wants more soil in the water. MT – new tiling equipment that allows farmers to install drain tile more accurately than ever. With tile, erosion is reduced 40% to 60% in most cases because the water table is kept at 2’ or 3’ deep, meaning when rain hits it can soak in rather than running off. 2) Keeping nutrients in the field rather than in the water. MT – nitrogen stabilizers help keep nitrogen in a form that doesn’t leach, keeping it out of the groundwater. 1) Feed the plant better. If plants have a balanced diet of the right nutrients, the food they produce will be healthier. MT – better soil and plant tissue testing allows farmers to know which nutrients their crops are short of. 2) Better pest control. When a plant is under stress due to weeds, insects or diseases it will produce more natural carcinogens. Just like you and me, we are healthier when we have fewer stresses. MT – biotechnology. I know you may be scared of “GMOs,” but when insects are controlled with proteins that are safe to humans, that means fewer pesticides are used on the crops. MT – safer pesticides. Did you know that many of the new products on the market today are just reproductions of natural things that exist in the environment? Callisto herbicide comes from a tree. Silencer insecticide comes from a flower. Headline fungicide comes from a wood rot. Most of the dangerous pesticides in the U.S. were banned years ago. MT – biological products. I prefer the term “natural” products, but there are a whole host of safe, naturally-existing bacteria, fungi and plant growth hormone products that are now being used in agriculture. While many people may lead you to believe that we need to go back to old-school farming techniques like we used 50 years ago (e.g. no pesticides, no biotech crops, no commercial fertilizer, etc. ), keep in mind that today our food is safer, our soil erosion has been dramatically reduced, our yields and food production per acre are far higher, our water is cleaner and our life expectancy is longer. In other words, farmers are doing a great job, and by utilizing modern technology these things will only get better. In my book, that’s better than conservation or sustainability. That’s improvement in ag. In 2015, VITAL will feature two of America’s most well-known and respected farming experts. 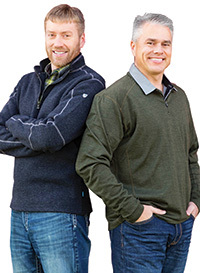 Not only are Darren and Brian Hefty successful farmers and agronomists, but they also host the popular television and radio show Ag PhD. Their programs help farmers take their operation from good to great by sharing information ranging from how to maximize your fertilizer program & tiling to stopping those yield-robbing insects and crop diseases and more. If you’d like to learn where you can watch or listen to Ag PhD, you can find the listings at agphd.com.